Apple has released the iOS 7.1 beta 2 download for developers this morning. The update comes exactly after a month of iOS 7.1 beta 1 release to developers. The latest update fixes numerous prominent issues with iOS 7 interface and let developers to make an ease move in the new iOS 7. You can check out the complete change log of iOS 7.1 beta 2 download here, and as well as download. Furthermore, the iOS 7.1 beta 2 download reveals Apple is getting ready for iOS in the Car feature release publicly in the starting of 2014. Apple has rolled out an update to iOS Dev Center, and launched the iOS 7.1 Beta 1 to developers this morning. The iOS 7.1 Beta 1 download is available now for developers only, but we are going to share the direct download iOS 7.1 beta links here. People around the globe looks for iOS 7 beta downloads on the internet. The download procedure of iOS 7 beta downloading is pretty simple but still makes trouble for many. However, let’s cut the thing here, and move towards the Download iOS 7 beta section of our website. We have already ready up the portal to let users download iOS 7 beta for their iPhone and iPad devices. It will allow users to easily download iOS 7 beta 1, and other beta updates on iPhone 4S, iPhone 5 and other devices. As we all know, Apple has released iOS 7 beta 1 to developers at WWDC 2013 Keynote this morning. 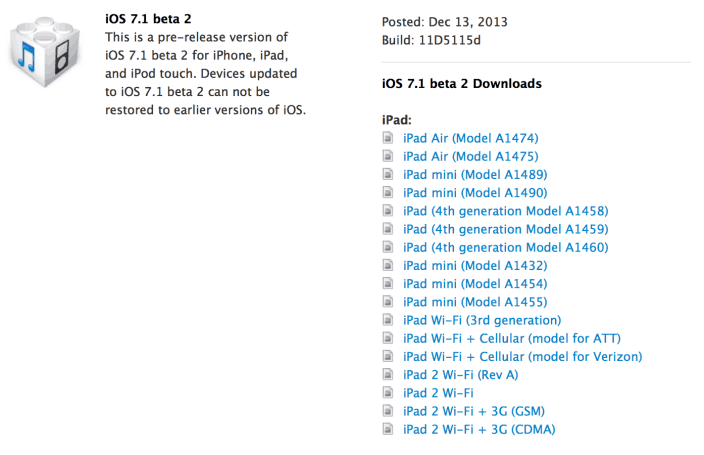 iOS 7 beta 1 download goes available to developers, and as well as for non-developers. Many people asked us for the iOS 7 beta 1 downloads, and wanted to download iOS 7 beta 1 on their devices. As per countless request, we have organized a portal on our website that allows everyone to keep track on iOS 7 beta downloads and provide all kinds/span> of download links for iOS 7 betas. How To Download iOS 7 Beta: 1) Sign On your Developer account 2) Download iOS 7 firmware for iPhone/iPad/iPod Touch 3) Open iTunes and connect your iDevice via USB cable 4) Select your device from the left navigation pane on iTunes 5) Hold down the Shift (Windows) or Alt /Option (Mac) key and hit the restore button on iTunes 6) Browse and select the downloaded iOS 7 IPSW file. Let the restore process complete. Download iOS 7 Beta 1 Direct Links (Unofficial Links Are Fixed Now! People are so curious to know about the latest iOS features, and user-interface. 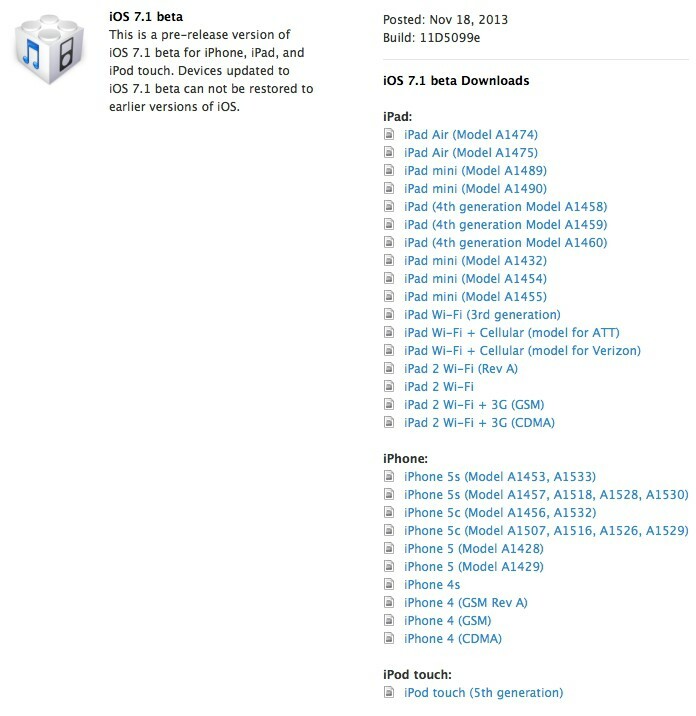 Apple has already previewed the next-generation iOS 7 to developers. iOS 7 beta download links are already available to developers, but other people with registered UDID’s can also enable the beta iOS version on the device and can enjoy latest iOS 7. However, before you go ahead with iOS 7 release & iOS 7 beta downloading. You should take multiple backups of your device, because the iOS 7 beta versions are released only to developers and they may not suite your demands. You can follow up with iOS 7 download beta’s here in our Download iOS 7 Beta Portal. If you are trying to install iOS 7 beta 1 on your device, and greeted with weird kind of errors or following up with the free guide without “UDID Registration” then you must check out our another guide on how to downgrade, and again install iOS 7 beta 1 on your device. It will allow you to easily downgrade and use your device again without causing any trouble. Apple has released iOS 7 Beta 2 to developers with iPhone / iPad / iPod Touch support. 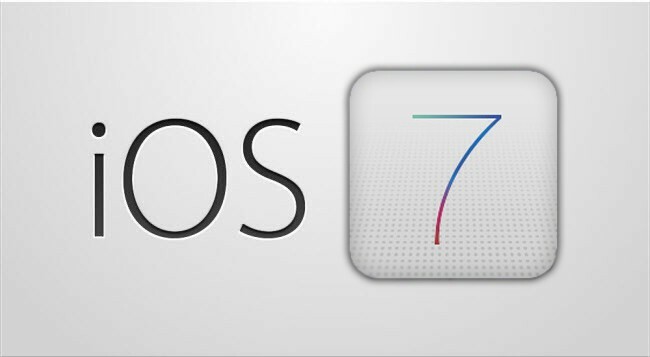 iOS 7 Beta 2 download links are available for non-developer users, and users with iOS 7 beta 1 installed on their devices can easily use OTA update to download iOS 7 beta 2 on their devices. A1429 works on GSM iPhone 5 of Asia (including Hong Kong, Japan, Singapore & South Korea), Australia, Germany & the UK. A1429 works on CDMA iPhone 5 on Sprint and Verizon in the US along with the KDDI network in Japan. Option 2: For those people without a developer UDID, please download the iOS 7 beta 3 ipsw & dmg files from Mega. The download links posted below. Please note that Mac users need to install the “Mobile Device Installer Package” for installing iOS 7 Beta Downloads. Apple has rolled out the iOS 7 Beta 4 update to developers with number of improvements and bug fixes. iOS 7 Beta 4 Download service is available at iOS 7 Beta 4 introductory page. You can find out the download links here for iOS 7 Beta 4 Download. Apple released the iOS 7 beta 5 to developers with major fixes over the layout issues on iPad devices. Furthermore, Apple fixed all the compatibility issues that were driving applications non-compatible with latest iOS 7. The update can be downloaded from these download links, and as well as via OTA update. 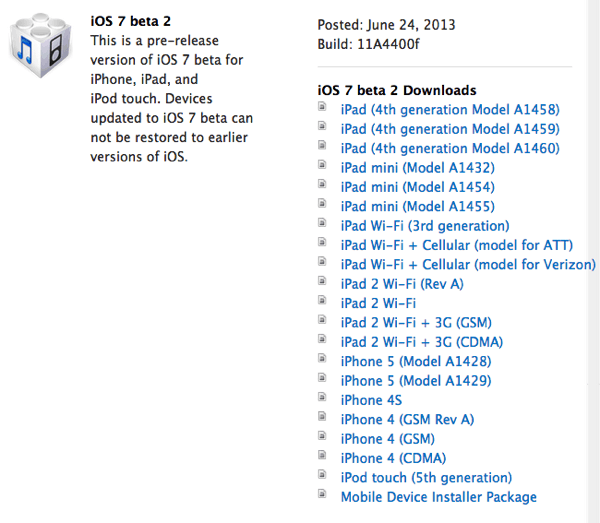 Apple disturbed the whole iOS 7 beta seeding schedule with immediate publishing of iOS 7 beta 6 update to developers. Apple seeded this update via OTA update to almost every iOS beta running device. It came with no major changes to the core of iOS 7, but fixed an issue with iTunes Cloud, and iTunes Match services on board. Apple has released the iOS 7 Gold Master build update to developers, and the iOS 7 GM download is available here on our iOS 7 GM download page. Furthermore, Apple has revealed that iOS 7 download will be released by September 18th. iOS 7 Downloads are available for non-developers, we are updating this section to bring more non-developer iOS 7 Beta Download links. what is the difference between non developrs link and unofficial link tha you have put on blog ? I’m Tom from germany and I want to help. But I need a Acc. What kind of help you want to do? hey tom what type of download is the iphone 4? CDMA or GSM? The iPhone 4 download link is for iPhone 4 GSM (original one) aka iPhone 3,1. What iphone 5 model is the download link for? The iPhone 5 link… is that for the A1429 model? It is for iPhone 5,2. Alright, great! Thanks for posting the link man I’ve been looking everywhere for this your the only website that has it. Sorry about this but I’m still not sure. I have the iPhone 5 A1249 model (CDMA and GSM). Is the link you provided us with the right one for me phone? Thanks buddy! I have also updated post with new links to make it less confusing for others. if i´m not a developer can i install it??? Yes, if you have registered your UDID. Just to complain a bit more, why is the format not ipsw? I’d like if you could link to http://cryptoanarchic.me/static instead of linking directly to files. I have blocked ALL downloads coming from this site to my direct mirrors. Please change your links to cryptoanarchic dot me slash static WITHOUT linking directly. I downloaded the iphone 5 link on my mac but the program wont open. Any ideas? So… You can’t install the download without registering the UDiD, which costs money, right? How do you register your UDID? Hi. I’ve just downloaded the ios 7. But i don’t know how to register my UDID :(. Can anyone help me? How do you register UDID? I Download and instal the the 7 on my iphone 4 but he is not working, there is a Message about developer account, how can I solve? that language is the beta only English? can i register my udid with you? What are these non developers link? does it mean we don’t have to register out UDID ? How do i register my UDID? what do I do with the downloaded file? nothing seems to be happening when I try and open it. Hey if I dont have registered UDID or does anyone know where ? Where is the iPod Touch 5 version? can you put it somewhere else than mega.co.nz because i have trouble getting that to work. Once a non-developer installs it – will he have to wait for the activation ? Will the ones who dont have a developer account will be stuck with an activation screen till September ? Could you explain non-developers how to install this ? My Phone said that I’m not a Reseller and that I should register my ID on the Deplover Website, and now? how to register your UDID if you are not developer? Would love to try out the iOS7 beta version. Can you post Xcode 5 Beta Download link please ? How I regist my UDID ? why in intsall so very slow ? how to registered? can tell me ? hey guys. i just restored my iphone 4s to ios 7 and it wants from me an id that belongs to apple developer . could u guys help me? Hi if I download the unofficial ios 7 for iPhone 5 will it work? What do you mean with registering your UDID? Do you maybe know where I can do it, probably you always have to pay for it. hey i do have iphone 4 is it possible to upgrade to ios7??? what about activation key? hey, how i do to install the iOS 7? what is UDID? I already downloaded from your link for my iphone 5 AT&T factory unlocked! I updated to IOS 7 for iPhone 4, and I can’t do anything (Restore, go to backups, etc;) Both iTunes and my iPhone are locked up in a “You are not registered as an iPhone Developer”. How can I fix this? why are the un-official links forbidden if you dont mind me asking? Hi, what is difference between “Download iOS 7 Beta 1 for iPhone 5” and ipone5(A1428)? Can anyone explain to me how and where I register my UDID, so I can acces this beta? Hi, how do i register my UDID, if i’m not a developer? Want to install iOS 7 beta 1 on iPhone for free? If yes, then this will help you! My developer account wont show up on my phone when i do what the heck am i supposed to do.. i’m in desperate need of help..
And it went as great as possible when i connect to my pc but my phone won’t go along..
Are the download links dead? como posso registra o meu UDID..
Oh my god, I NEED HELP!!! I downloaded the file from your site and installed it. Well I kinda temporarily bypass the activation for a developer account. Now I wanted to restore it back to iOS 6 but in my iTunes, it says that my device is not registered. I can’t restore it back to iOS 6. My phone is now stuck at a useless iOS 7. Help! Hi Kevin, first of all sorry for late reply. You can easily downgrade your device to iOS 6.1.3 or iOS 6.1.4 using iTunes. If you need any help, just ping me on Twitter @hamza_tariq. The model i have is MD298HN/A. I am in India and would like to know which beta version to install. Also how do i register my UDID or what does that mean? UDID is a unique identifier ID for iOS devices that allow Apple to keep track on iPhone and iPad devices. To install iOS 7 beta 1, you have to get registered your UDID from anyone’s use developer account. Furthermore, you have to check about your iPhone model before downloading any file. Use iPhoneWiki.com to get information. Does that really work ? where is the download for the ipod toucj 5th??? Hey I am downloading the iPhone 4S 7.0 beta now, I was curious if I had to register my UDID? And if I did how would I do so? hi after the file is downloading on the mega screen now, just wondering after its finish what do i do after to get it on my iphone? Please try the procedure twice but the message stating that I am not the developer who is for me to log into the site … Know how to help me? I’m just a bit curious about the updating on iOS 7 Beta 1. Will it be able to update to newer betas? Like will it be able to update to iOS 7 Beta 2? And also will the iOS 7 beta 1 (or newer) be able to upload to the final iOS 7 when released? I would really appreciate some help, since I find these questions very relevant when updating to iOS 7 Beta 1. First time updating to a beta. So might be stupid questions. i need help. i downloaded from mega.co.nz for the iphone 5 iOS 7 beta. i did the a1429 model, do i do the other one? im from the u.s. it downloaded and then went on to try to restore it and holding the alt key on my mac, and its saying that the firmware file is not compatible. what do i do? do i need to download something else. im new to all this. help me please. Why does it stand like this on itunes ? And i cant do anything with my mobile ? i tried it and i got stuck in DFU mode ….what should i do now?? Try to get out of DFU mode. It is easy, if you know how to hard reset iOS device by holding both home and power button for few seconds. What is the developer ac. ? How i get someone ! Which link should I use for an iPod touch 5th gen? Broke my phone a few weeks back, so I’m stuck with this for now. Which iOS 7 version you have downloaded? Which version of the iOS downloads is applicable to the iPad Mini? this is completely safe to download, correct? i’d just rather be safe than sorry! Just wondering before I install iOS7, are the apps like WhatsApp and Facebook compatible? Send me a email at [email protected] including UDID and I will register you in a few minutes. So you 100% legally can use the iOS7 on your device. Also please provide device type. When I try to install iOS 7 it tells me that the file is corrupted. I downloaded the iPhone 4 version as my iPhone is the iPhone 4. Please help! Thanks! Hey i did what you said and went with the download for the iphone 5 i’m having the same issues as andre? now you got me worried it isn’t going to work so i’m doing a restore and it says its gonna take 3 hours. I have the same problem as Timo. Now how can we surpass this? Please answer us so we can restore back to 6.1.3 . This is probably a dumb question, but what do you do after you download the MEGA link? It opens iTunes but when I click restore it just says it’s going to download 6.1.3, so that’s what I’m doing now. Will it show iOS 7 when I’m finished updating to 6.1.3 or is there more to it than that? its says not eligible for the requested build..why is that? Will the iphone 5 download work for an iPod 5 cause I had an iPod 5 and theres no link for it. The iOS 7 beta 1 for iPhone 4 is saying that it’s not compatible with my iphone 4. Why? Hey tom, using the non-developer links, do i just download ios 7 for iphone 4s and restore my phone to it? Thats all? Hey Admin. I installed ios 7 without a UDID and now i’m stuck in limbo on this ios 7 activation screen. And when i go into itunes there is no restore option, it just says “we’re unable to complete your activation”. Any ideas? The iPhone “iPhone” could not be restored because the firmware file is not compatible. Any idea how to get pass this anyone? Is there a link for an iPad 3 download? Downloaded it and now iTunes says “This device is not registered as part of the iPhone Developer Program.If you are a member of the Program, please register your device in the iPhone Developer Program Portal.”. My phone is stuck on activation screen and useless! I can not downgrade back to old version because iTunes wont let me go anywhere but the developer site!!!!! What am i suppose to do???? Thank you a lot! My iphone4s works great with the ios7! Was wondering whether you are able to restore a previous backup once you have upgraded to IOS7. MY UDID is not registered as a Developer UDID. My Backup was created on 6.2.1. I downloaded the firmware for iPhone 4S and i’m using windows on my comp. But the file is in .dmg format? How to open it? Hello if i download iphone 4 ipsw and use it in ipod touch will something happen . If i use iphone 4 ipsw to download it on ipod touch 4 would it work??? Thank U! Thanks a billion… I was able to update my iPhone 4…. hey it work good and i install the ios 7 on my iphone but there is a problem when i restore it only the photos and pics appears but not the apps even though i back up all the apps what can i do ? HEY GUYS. PLEASE READ THIS COMMENT. YOU HAVE TO HOLD DOWN THE SHIFT (WINDOWS) OR ALT/OPTION (MAC) KEY AND HIT THE *UPDATE* BUTTON NOT THE RESTORE BUTTON. ehh hello, i first time downloading this beta version and i want to ask you that if i update my phone to ios 7 beta, will i still be able to update it to further beta version through the phone or any other update given by you guys ?? I tried updating to iOS on my iPhone 4 but it says firmware not compatible 🙁 Help me! Hey, i restore my iPhone 5 to ios 7 but i dont have a developer account. And i cant use my iPhone cause need this account. Please help me! How do I get a UDID code? Hey if I download it on my iPhone 4S will everything be erased and is it illegal. Also will it mess up my phone in any way. I’m scared to do it. Please answer! Great resource. But you really, really need to update the post to reflect 1) UDIDs have to be registered prior to installing, and 2) 1428 is GMS version and 1429 is CDMA. You’ll have way less comments and issues if you spell that stuff out. The last thing you want is people blaming you for messing up their phones. Seriously! John! I have been trying to resolve this issue at my best! I will surely add these points. Does it make the phone slow or mess it up in any way? it keeps saying it cant update because the firmware isnt compatible anyone know why? Mine says the same thing…Did you find a solution? i have the same problem does anyone know what to do? If your phone wont turn on what can you do? can you still download ios 7 if your phone is jailbroken?? it says not compatable what do i do?????!!!!!!!! Links ios 7 beta 2 are developers or not? mine wouldnt work either, but i had to download where is says ios7 beta 3 with the mirror links, find your device and download the first mirror link, i mean a little laggy but nice design!